I am a black female American expat in Japan who fancies herself a sociable nerd that loves talking translation and Japanese Studies. This blog is about me, music, and coffee. Here’s the first post. While I repeatedly fail at the use of social media, blogs, and all the like, I decided I would try this. Give myself the chance to get some thoughts out, maybe some poetry if the words flow. Mostly, I want to share pictures of all the coffees I drink here in my life in Japan. Nearly six years in various parts of Japan has given me the chance to grow and become this thing that resembles an adult. I love music and coffee and literature and sci-fi and anime. I love translation theory and the Japanese language. I love the English language. Art and coffee and becoming an adult. That’s what this is all about. In other words, it’s about me. It’s been a while. Well, lots of updates. I’m returning to the U.S. indefinitely in about 2 months. It’s crazy to even think about. So instead, let’s focus on some of the things that I’ve been up to. Hmm…finished my M.A. thesis. Finished classes. Sang a lot of Miyano Mamoru and some nerdy songs at karaoke. Drank coffee (of course). So much has happened that I don’t really know where to start or end. So, let’s keep it short for today. Go for, let’s go, next stage! Being a foreigner in Japan means doing a lot of odd jobs here and there that mostly center around teaching. As such, I have done my fair share of teaching. I love it though. Teaching kids, to me, is one of the most delightful rewarding things I have ever had the opportunity to accomplish in my short life. Now, however, I am trying to change it up. I work part time at a publishing company that puts out various books and magazines for English learners in Japan. It’s fun and challenging and new, but it’s a step in the direction I need to become a translator or localizer. But I still teach! and hates pink! aka she’s my hero! This girl, let’s call her M, went to San Jose and then Disneyland this past week. She told me ALL about it today and how much she loved it. At tye end of lessons, she asked me ゛You still like chocolate chip cookies right? !゛(I told her as much two weeks ago on a whim) When I nodded, she immediately got excited and brought me a bag – more specifically, a souvenir! Stoked! Lo and behold, there are chips ahoy cookies in the bag. YOU CAN’T GET THEM IN JAPAN! This little kid thought so much about what to get me. I’m humbled. I’m blessed that I get to experience the pure expression of children as only an educator could. Anyways, the moral of this story is, I’m happy with my life. You never should compare your life to others. What brings you happiness, so long as it doesn’t hurt you or others, should be pursued. I’ve given up a lot to be where I am. And I’ll keep giving things up. That’s okay! I know they’re writing songs of love, but not for me, and I’m okay with that. I live for me. That’s all I can do! 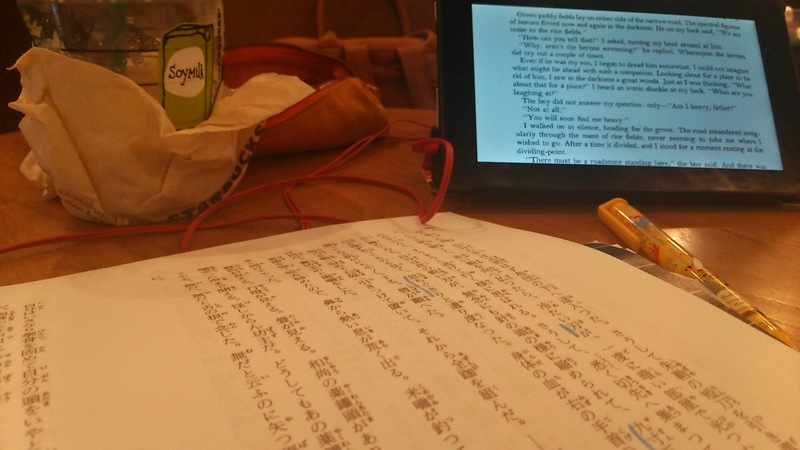 Today’s coffee was Coffe Frap while reading Soseki. …And then I don’t feel so bad! Today is so windy and super sunny. It’s days like this I feel thankful for life. This world’s ugly and you gotta make the best of it. Today’s plan is to do a little research and then go out with my friends for dinner and drinks. BUT….first I have to get out of bed! I’ll drink some coffee and then I won’t feel so bad! Today’s image was yesterday’s coffee. Just coffee with two sugars and two creamers. Gone! This February my sister lost her fiance. It’s been difficult for us all. It’s been hard for me to be apart from her. You see, my sister is my world. Everything I find good about this world stems from everything she taught me. She gives me love unconditionally and all I can do is try to give it in return. See, family is chosen. But I was lucky enough for my family to be given to me. Truthfully, I have decided to leave Japan this fall and return to America in order to be with my sister and my family. So why all this when the picture is a Tully’s Soy vanilla latte?! Actually, it’s what you see in the back – looks like a composition notebook right? It’s my Kindle cover that my sister gave me. I was stressed with school (M.A. program in Translation Studies and Japanese Culture Studies) and lo and behold, she sends me a Kindle Fire which is perfect for my studies!! I truly treasure it. It’s more than tech and pretty cover, it’s a gift my sister thought about and sent to me in my hour of need. Perfect! It may not sound important to you, but it meant everything to me. This was a month before she lost him. I want my sister to know that even with all of this everybody finds love in the end. Be it from friends, family, future lovers, or strangers – there is love. どんなに怖くたって目をそらせないよ、すべては終わりに愛があるなら。If there is love at the end of it all, no matter how terrifying, I will never look away.